Dallas — Texas Central, developers of the high-speed railroad, named international railway company Renfe as the train’s operating partner, adding another industry leader to a project that will revolutionize Texas travel. Renfe is one of the world’s most significant railways operators, running 5,000 trains daily on 7,500 miles of track. The company is integral to the transport system in Spain, its home base, handling more than 487 million passengers and 19.6 million tons of freight moved in 2017. Selection of its operating partner marks another major step forward for the Houston-to-North Texas high-speed railroad. of Texas Central’s operation and maintenance plans, preparing the railroad for passenger service. The operator will run the trains; maintain system components, such as the engines, signals and other equipment; oversee ticketing, passenger loyalty programs and other services. “Today’s announcement is extraordinary news for Texans and for the Spanish railway industry,” said Isaías Táboas, president of Renfe. “Texas Central represents a large high-speed train project in a country with high-growth potential, for which the Spanish experience will be of great help. The agreement is the latest example of the project bringing on board the industry’s best subject matter experts from across the globe. It comes about a week after Texas Central said it had engaged the multinational firm Salini Impregilo – operating in the U.S. market with The Lane Construction Corporation – to lead the civil construction consortium that will build the passenger line. It will be responsible for all work up to the top of the rail, including viaducts, embankments and drainage. Spain´s first high-speed line between Madrid and Seville was dedicated in 1986 and Renfe’s first high-speed service connected the cities in 1992. More than 360 million passengers have since then used that fast, secure, comfortable and sustainable mode of transportation. Its second high-speed line, from Madrid to Barcelona, was completed in 2007. More than 85 million passengers have used the line in its first decade. Renfe also operates high-speed service from Barcelona to Paris, Lyon and Toulouse in France. Among other major international projects, Renfe operates the recently opened high-speed train between Mecca and Medina, in Saudi Arabia. “This is another in the growing list of world-class firms not just recognizing America’s first true high-speed train project but also wanting to be involved as central players in a great story, making it happen. This is a vote of confidence in one of our most iconic infrastructure projects,” said Norman Anderson, chairman and CEO of CG/LA, a Washington-based strategic group that focuses on infrastructure investment. The 200-mph train will provide a safe, reliable and productive travel option linking the nation’s 4th and 5th largest economic regions in 90 minutes, with a midway stop in the Brazos Valley. The investor-led Texas project will be built and operated without taxpayer-funded state or federal grants. It will generate an estimated $36 billion in economic benefits statewide over the next 25 years, including creating 10,000 direct jobs per year during construction and 1,500 permanent jobs when fully operational. 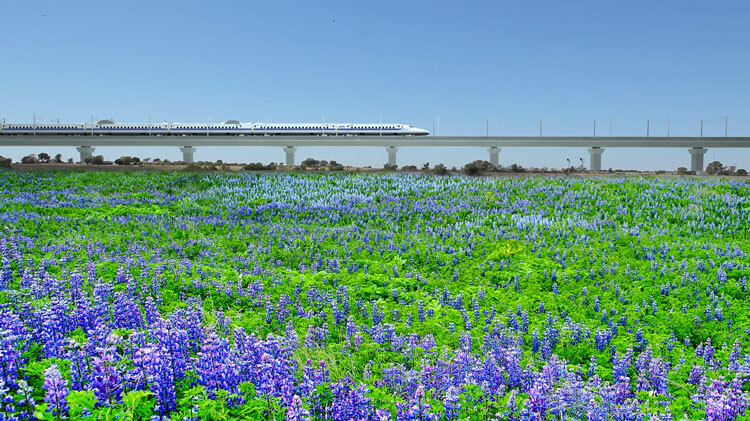 The Texas train will be based on the latest generation of Central Japan Railway’s Tokaido Shinkansen train system, the world’s safest mass transportation system. It has operated for more than 54 years with a perfect record of zero passenger fatalities or injuries from operations, and an impeccable on-time performance record.